Biotinylated Human HVEM, Fc Tag (HV4-H82F1) is expressed from human 293 cells (HEK293). It contains AA Leu 39 - Val 202 (Accession # NP_003811). The protein has a calculated MW of 45.8 kDa. The protein migrates as 55-66 kDa under reducing (R) condition (SDS-PAGE) due to glycosylation. Biotinylated Human HVEM, Fc Tag on SDS-PAGE under reducing (R) condition. The gel was stained overnight with Coomassie Blue. The purity of the protein is greater than 95%. Immobilized Human LIGHT, Mouse IgG2a Fc Tag, low endotoxin (Cat. No. 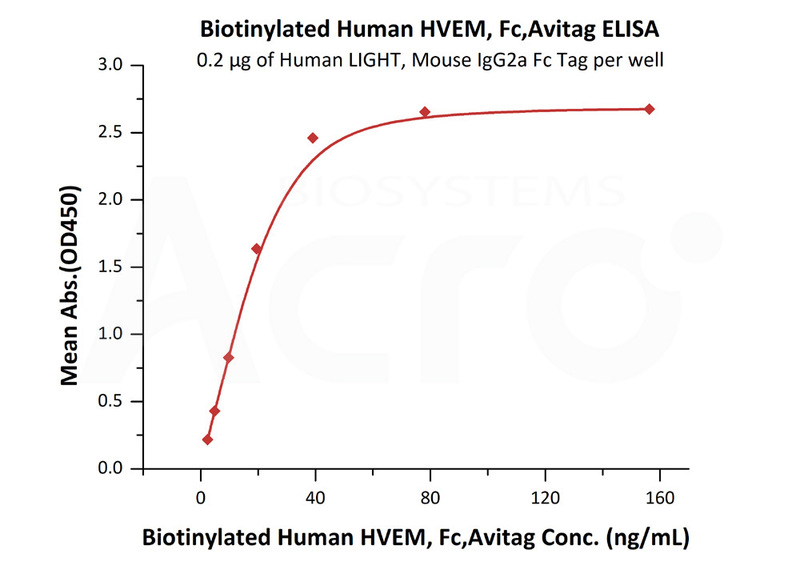 LIT-H5256) at 2 μg/mL (100 μL/well) can bind Biotinylated Human HVEM, Fc Tag (Cat. No. HV4-H82F1) with a linear range of 0.6-39 ng/mL (QC tested). Immobilized ActiveMax® Human TNF-beta (Cat. No. 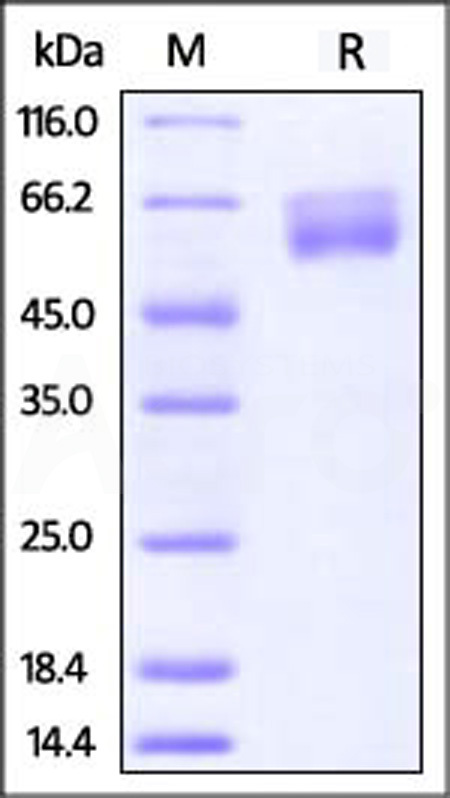 TNB-H5214) at 10 μg/mL (100 µl/well),can bind Biotinylated Human HVEM, Fc Tag (Cat. No. HV4-H82F1) with a linear range of 0.6-10 μg/mL (Routinely tested). Herpesvirus entry mediator (HVEM) is also known as TNFRSF14, TR2 (TNF receptorlike molecule) and ATAR (another TRAF associated receptor), is a type I membrane protein belonging to the TNF/NGF receptor superfamily. HVEM expression has been detected in peripheral blood T cells, B cells, monocytes and in various tissues enriched in lymphoid cells. The extracellular domain of HVEM has been shown to interact directly with the herpes simplex virus envelope glycoprotein D (gD). Two TNF superfamily ligands, including the secreted TNFβ (lymphotoxin α) and the membrane protein LIGHT (lymphotoxins, exhibits inducible expression, and competes with HSV glycoprotein D for HVEM, a receptor expressed by T lymphocytes), have been shown to be the cellular ligands for HVEM. Besides HVEM, LIGHT can also interact with LTβR, the receptor for lymphotoxin αβ heterotrimer. The role of the HVEM LIGHT /LTβ receptor ligand pair in immune function and herpesvirus pathobiology remains to be elucidated. (1) Hsu H., et al., 1997, J. Biol. Chem., 272:13471. (2) Mauri, D.N. et al., 1998, Immunity 8:21. (3) Montgomery, R.I. et al., 1996, Cell 87:427. (4) Cheung,T.C.et al., 2005, Proc.Natl.Acad.Sci.USA102:13218-23.